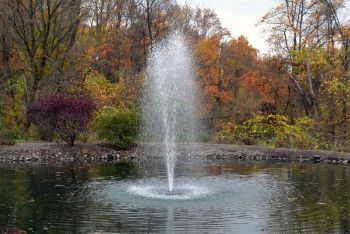 Versatile, adaptable floating fountain for large ponds and lakes. 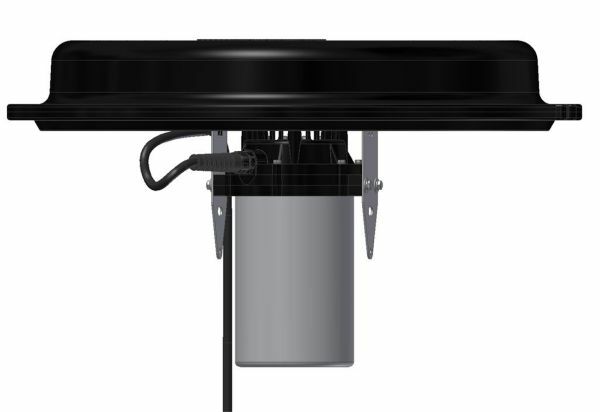 Complete system includes pump, low visibility float, 30 metre/230V Cable and Cable Joint Kit. 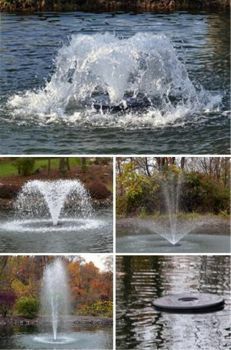 Supplied with 4 Fountain Nozzles & Mixer Nozzle (requires manual assembly to change patterns). 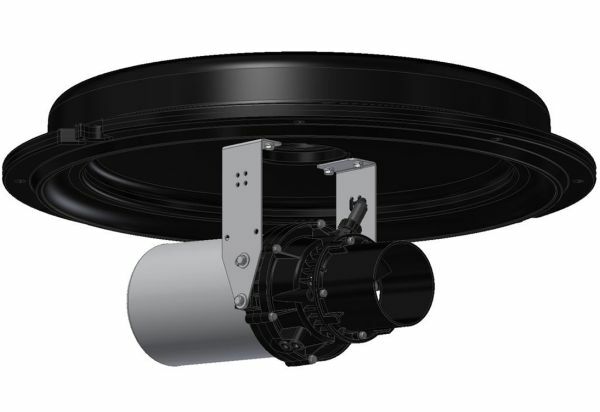 Can be easily converted to a horizontal mixer with angular adjustable discharge. 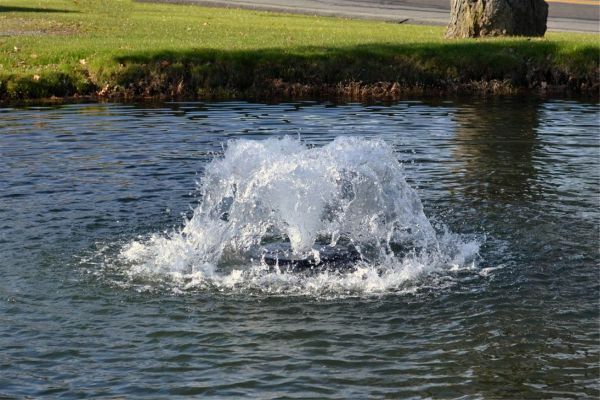 Flow Rates up to 115,000 Litres / Hour. Each Aerator is capable of aerating ponds and lakes up to 2000m² (0.5 acres). 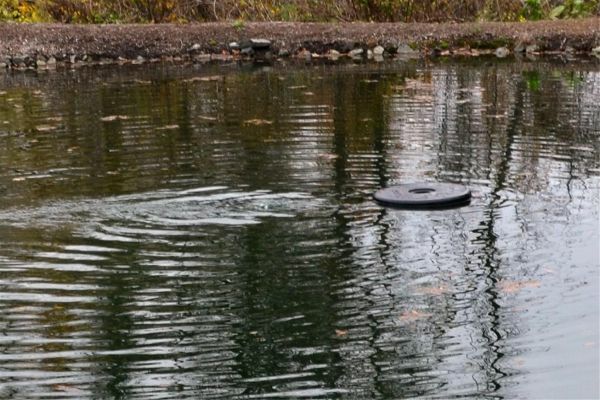 Operates in water depths of 41cm (16”) or greater – ideal for problematic shallow water zones. 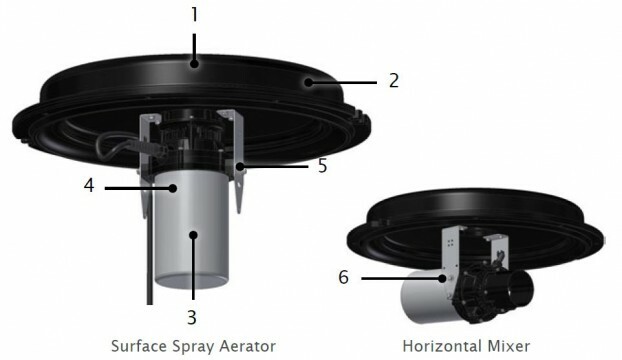 Simple to install and can be easily repositioned after installation if needed. Energy efficient means of circulating and oxygenating pond and lake waters. 0.5 Horsepower single phase 230V Motor. 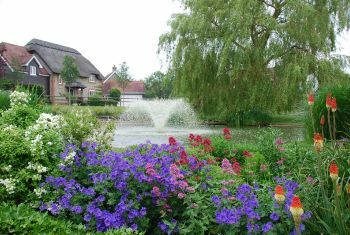 Effectively controls algae, aquatic weeds and foul odours as well as creating horizontal currents – thus deterring insects and insect breeding in otherwise stagnant water zones. Optional Illuminated System also available. Click here to view. Technical Details for 5-in-1 Aerator Fountain & Mixer System. 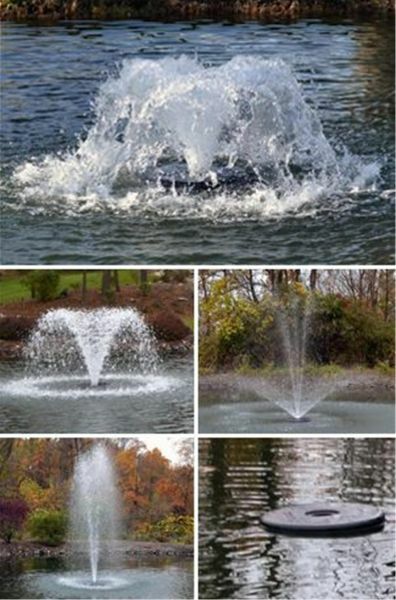 5-in-1 Aerator Fountain: Nozzle Performance Data. 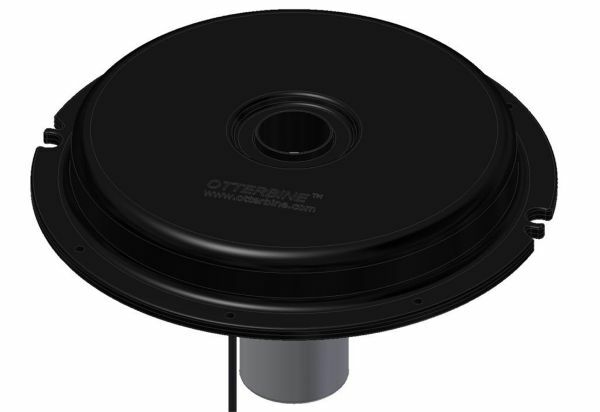 *1/2HP Mixer volume influenced is 6938m3 and effectively moves water 35 linear meters. 5-in-1 Aerator Fountain: Technical Dimensions. 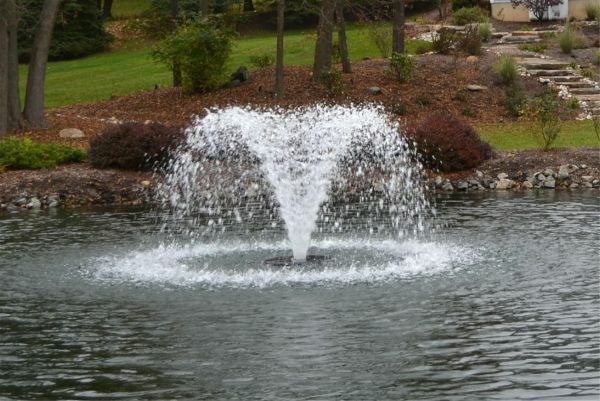 5-in-1 Aerator Fountain: Mooring Suggestions. 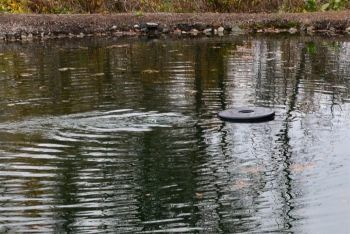 Mooring of the Aerator can be easily achieved using heavy duty fishing wire and suitable ballast such as concrete slabs (not supplied). 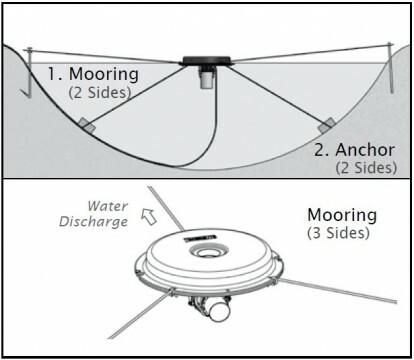 When setting up in horizontal mixer configuration, 3 mooring tie points should be used to prevent the unit from moving across the pond or lake water surface. 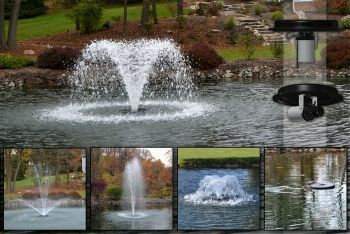 5-in-1 Aerator Fountain: Product Components. 1. Complete set includes corrosion resistant adjustable spray impellers to produce 4 different spray patterns and a horizontal mixer. 2. Rugged, low visibility foam filled polyethylene float with recessed light pockets (2 x 20w Submersible Halogen Spotlights and Underwater Transformer supplied with Aerator with Light Set version). 3. Oil cooled, efficient 2750 RPM custom built motor incorporates a silicon carbide single seal to ensure dependability and long service life. 4. Corrosion resistant, durable 18 gauge / 316 grade Stainless Steel motor housing. 5. 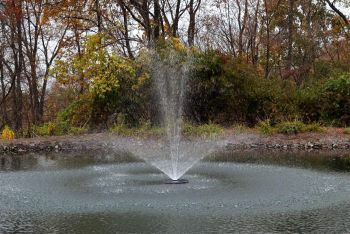 Stainless Steel brackets allow for easy conversion between aerating fountain patterns and mixer model. 6. 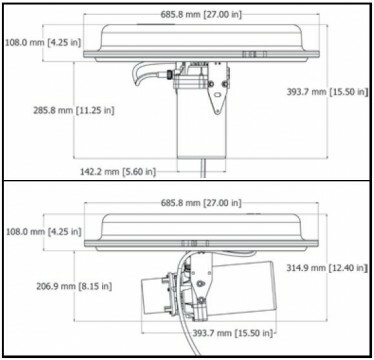 Adjustable discharge angle of +/- 8 degrees in horizontal mixer configuration.